AMMAN, Jordan—The Trump administration on Tuesday denied claims by senior Iranian officials that the United States has been making secret overtures to Tehran in pursuit of backchannel talks, the Washington Free Beacon has learned. A senior aide to Iran's Supreme Leader Ali Khamenei claimed earlier this week that the Trump administration approached Tehran late last year in Afghanistan to seek high-level meetings with Iran amid a flurry of regional issues concerning Tehran's continued support of terrorism and its expansionist foreign policy pursuits. "During my visit to Kabul last month, the Americans … asked to hold talks," Ali Shamkhani, a top official in Iran's Supreme National Security Council who enjoys close ties with Khamenei, was quoted as saying in multiple regional reports carried by Iran's state-controlled media. U.S. officials quickly slapped down the reports when approached by the Free Beacon for comment, but said President Donald Trump remains open to renewed negotiations with Iran. "This report is not accurate," a State Department official told the Free Beacon. "As the president has said, he is prepared to engage in dialogue with Iran to find solutions to urgent national security issues," the official said, speaking only on background. "The United States is looking for the Iranian regime to make fundamental changes in their destructive behavior." "Our ultimate goal is to negotiate a good deal that ensures the safety of the American people and addresses the full scope of the Iranian regime's malign activities," the official added. Secretary of State Mike Pompeo is on the first leg of an eight-country tour of the Middle East, in which he will urge regional leaders to help the United States combat Iran's malign activities. During his first stop in Jordan, Pompeo affirmed the Trump administration's commitment to regional security in light of its decision to withdraw U.S. troops from Syria. 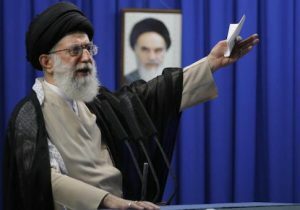 The decision sent ripples through the region and prompted concerns the United States is vacating the region as Iran and allies such as Russia establish a greater presence. The peace process between Israel and the Palestinians also was brought up in conversations with the Jordanian foreign ministry before Pompeo attended a scheduled meeting with Jordan's King Abdullah.